After a couple of more politically charged posts recently, on Tibet and North Korea, it is definitely time to revert to type. A travel story! After living in Thailand for 4 months, followed by a 6 week saunter through northern India, Leslie and I are now in steamy Darwin, home of humidity, crocodiles and my brother Ian. So with some apprehension, Leslie and I donned our swimmers, clenched our nerves tight, and climbed into the infamous cage. I won’t lie, it was pretty daunting. Of course it is totally safe, but to willingly go face to face with a predator so advanced and perfect that it hasn’t needed to evolve since the age of the dinosaurs, with just 30mm of plastic between us and its cavernous jaws, was quite intimidating. But you know what they say, ‘audere est facere,’ or, ‘to dare is to do.’ So in we climbed. And that’s when the shrieking started! Leslie: EEkkkkkk, aarrgghhh, oh my gosh, oh my gosh!! Me: Are you okay, love? Leslie: You know the cow scene from Jurassic Park, when the cow gets lowered into the Tyrannosaurus compound? Well, that’s how I feel right now! And she was right. The winch slowly raised us up and out into the middle of ‘Chopper’s’ aquarium pool, and we hung there, helpless, waiting to get lowered to our fates. 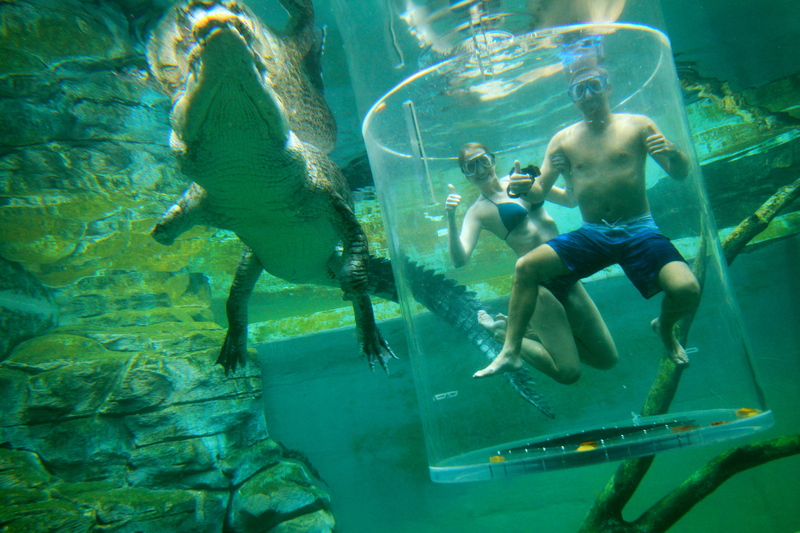 I could hear my brother laughing from beyond the fence, urging his co-workers to drop us in, or make the croc angry. Then the winch lowered us down, and as the water began to fill the cage, Leslie’s shrieks went up a pitch. It was surreal. 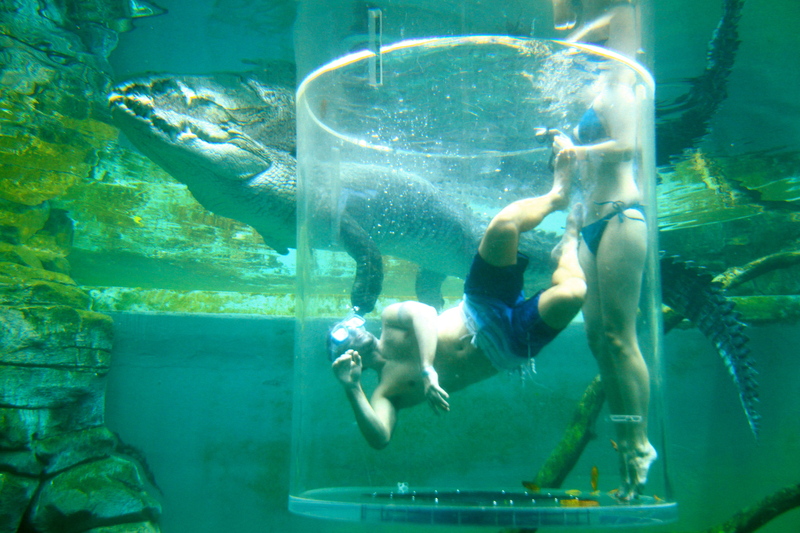 5.5 meters of magnificent crocodile stalked the cage, ready to pounce on any finger inadvertently slipped through the water inlets. Estuarine crocs are huge, but it’s not until you see them from a fish eye view that their sheer size and power become apparent. Weighing in around 800kgs, Chopper has an estimated bite force of 34,ooo pounds per square inch. For context, a T-Rex was thought to be less than half that, and an adult human a paltry 120 pounds of pressure. Scary stuff. The croc keepers at the park then do their thing. With tempting chunks of beef or buffalo, they dangle the meat close to the cage. I could hear my brother gleefully encouraging me to put my face against the perspex. I had to, didn’t I? And aided by an almighty swoosh of its dragonesque tail, Chopper, right on cue, chomped the meat while simultaneously slamming his gargantuan jaws against the cage. It was terrifying. So close to perhaps the world’s most awesome predator, right when he was hungry! Check out Leslie’s scream!! I just need to add this. 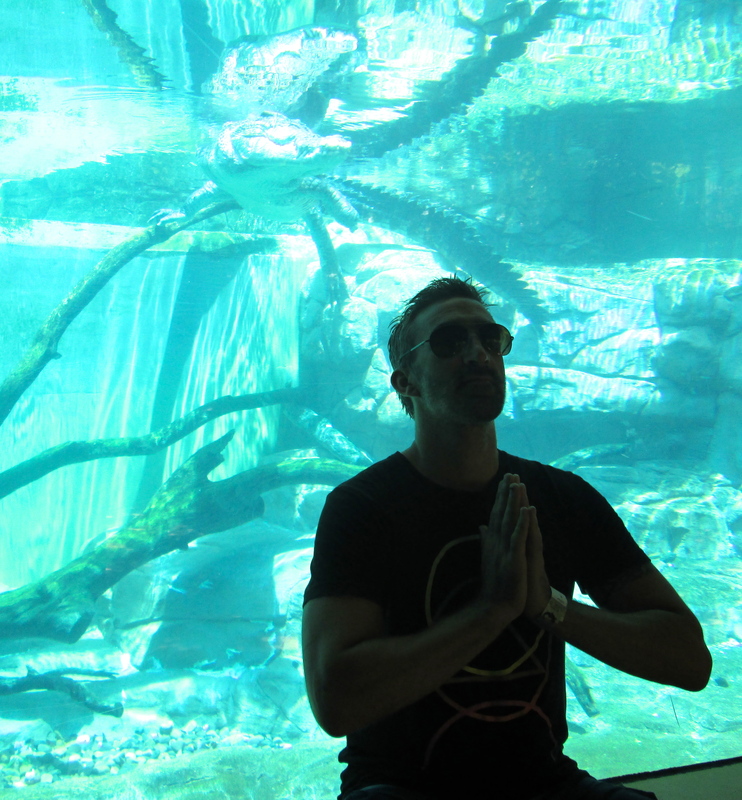 Usually I’m not a fan of zoos, mainly because I am not convinced by some of them at their ability to treat the animals properly. 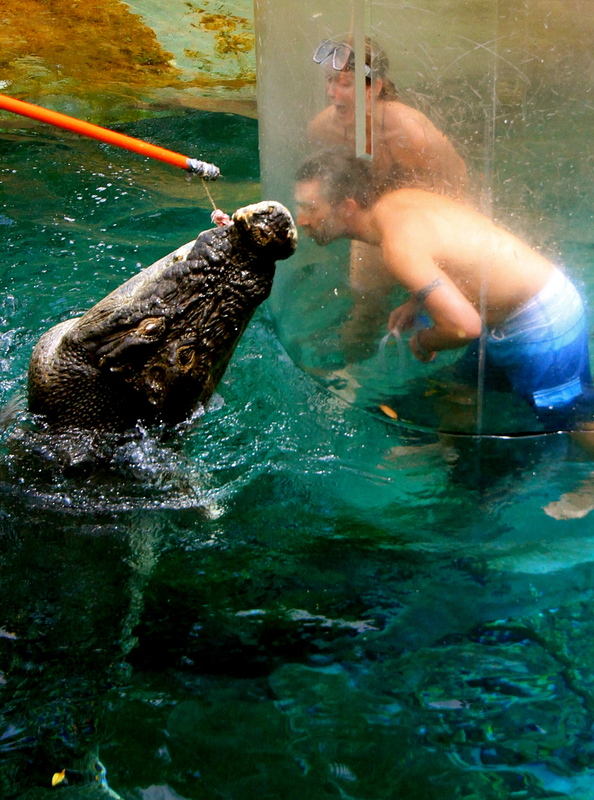 But at Crocosaurus Cove, all the crocs, and the vast array of other creatures on display, are cared for brilliantly by a highly skilled and conscientious team of handlers. The only thing likely to get hurt during the Cage of death was my ego. So after a wild and frightening 15 minutes diving with Chopper, Leslie and I left the cage intact, with another amazing experience completed. They even sold stickers with a photo of Leslie on, just for proof. With a GoPro camera loaned us as part of the package, we attempted to film our experience (or was it a farewell video message in case we didn’t make it?) Take a look. And turn up your volume for full human soundtrack and some cool music. It’s my first ever video post…forgive me. 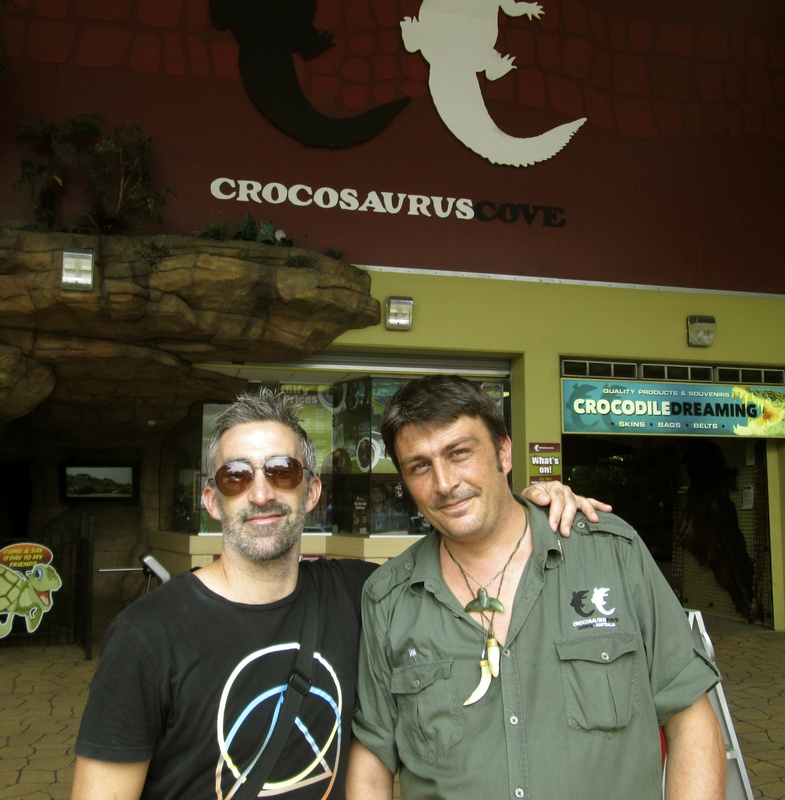 If you’re ever in Darwin, an underrated city in my opinion, then stop by at Crocosaurus Cove and say G’Day to my brother Ian. 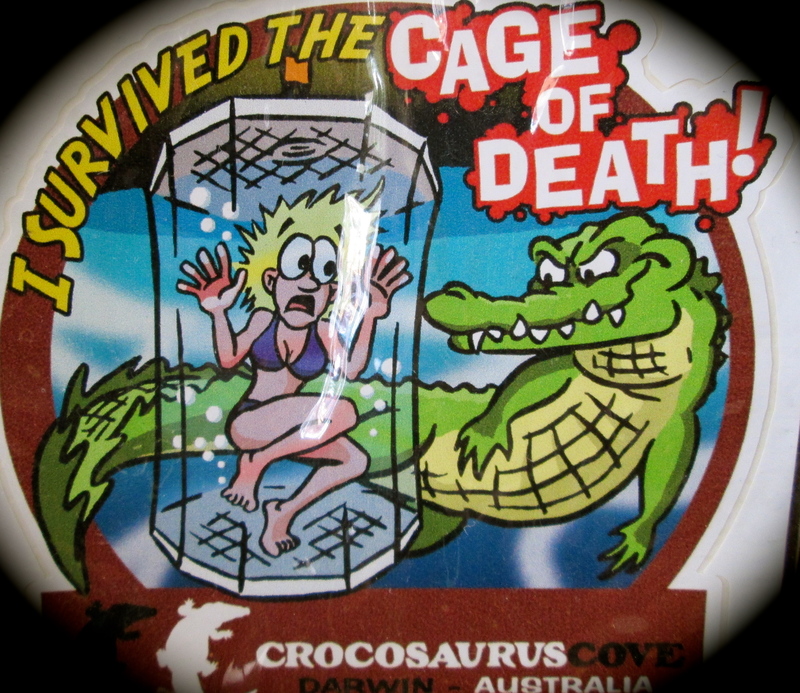 And while you are there, of course you should brave the ‘Cage of Death.’ You won’t regret it, that is, if you survive?? We did!! NB: All the fantastic photographs of our time in the cage were taken by Croc Cove photographer Jenna Natalizio, of Outer Edge Photography. Great job mate, and thanks. I rarely watch videos, but I’m so glad I watched this one if not for Leslie’s shrieks and the ending credits hahaha. What a crazy experience. Well done for a first video, too! Awesome bud… Or Orsm as Juniour would say… I had simialr experience going into lions cage armed with a stick… check my FB honeymoon photos..
I’ll check the photos mate. Yes, ORSM is right. And thanks for commenting on here chap. exciting but I don’t have the courage to face this big crocodile! Hey, thanks for stopping by. It was a little scary at first, but the reality is it was very safe and the staff are excellent. 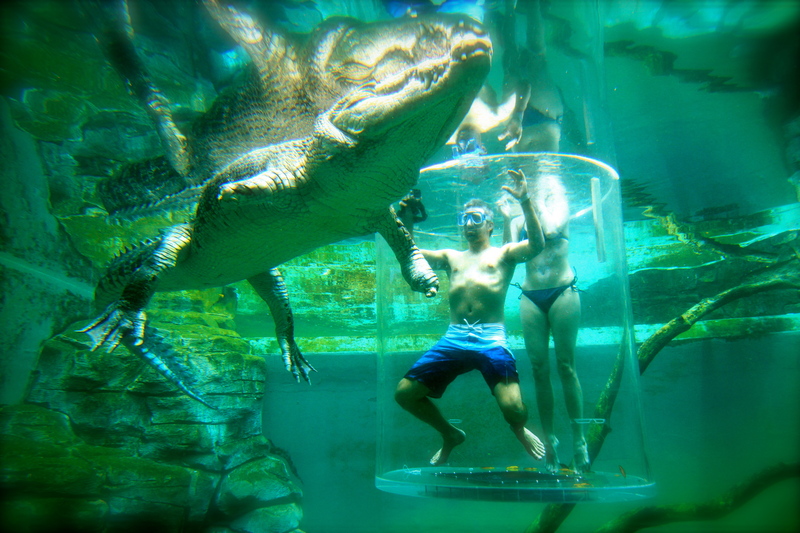 You should give it a try next time you’re in Darwin…face your fears.